The fuse has been burning in Syria for five years. Now the powder keg is about to explode! Isaiah 17 predicts the destruction of Damascus, Syria. Now more than ever it is important for Christians to be alert to the Bible prophecy that is unfolding in Syria. For that reason I have edited and compiled all of my commentaries about Syria into this one book. These commentaries appear throughout several of my other books. 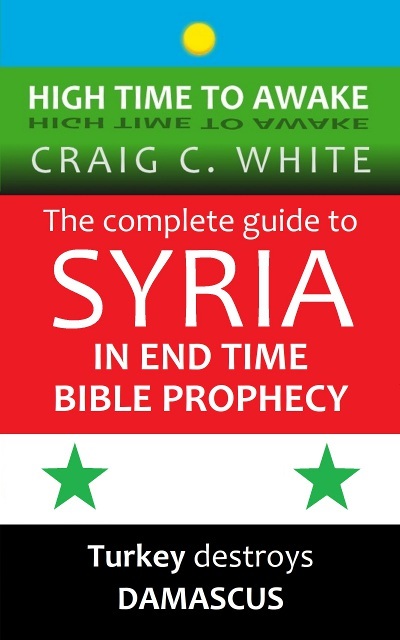 This book contains everything that you need to know about Syria in Bible prophecy as you watch events unfold in the coming days. The city of Damascus is the capital of Syria. It is a large prosperous city with modern amenities and an ancient history. Damascus is one of the oldest continuously inhabited cities in the world. It was founded by the Aramaeans over four thousand years ago, and was inhabited two thousand years before that. Damascus is a living depiction of human history. Today Damascus is dying. According to Old Testament prophets Isaiah and Jeremiah; Damascus, Syria will be destroyed. I think that the Bible tells us that Turkey will enter Syria and destroy Damascus. This could be the prophetic event that puts the end time into high gear! Syria has been fighting for the past seven years, in the midst of a hostile takeover by outside forces. During that time Damascus has suffered some damage, but has been mostly spared. Now Turkey has amassed 400,000 soldiers on the Syrian border. Now Turkish President Erdogan has vowed to remove Syrian President Assad from power in Syria’s capital city of Damascus. Now Turkey has acquired world wide support for their invasion into Syria. Buy a Paperback. Buy the Kindle edition Free! It’s beginning to happen now, Craig! It’s exciting to watch the Turkish military move into Syria. I’m excited for the subsequent prophetic fulfillments and the rapture! Do you think that Israel’s 70 anniversary coming up soon has any significance on when things will happen? Hi Jennifer. I don’t know of scripture that would identify the seventieth year anniversary of Israel regaining their land but just the same I am eager with anticipation concerning May 14, 2018. Considering the fact that Turkey is near Hamah and Tell Rifaat; and Syria and Iran are threatening Israel; end time events are ready to happen. When the Turkish led invasion fully kicks off, then hopefully the “Macron is the Antichrist” fever will subside. I’ve noticed how ridiculous the hysteria is getting. At least then Hal Lindsey and others could devote more attention to Erdogan and perhaps wake up more people. I don’t think that these people are teachable. I recently commented on social media that Matthew chapter 24 refers to Jerusalem and Judea during the Tribulation. Matthew chapter 24 does not refer to the Rapture of the Church. I was told that I was a deciever and that I am going to hell. These people who cling to such nonsensical theories can not endure sound doctrine.